This rhythm shooter offers big ideas and an excellent soundtrack. Like having a drunken conversation with a friend who really loves music, but it's a videogame and good. What is it? An on-rails shooter about the evolution of life. Let's start with the basics. Rez is an on-rails shooter, originally released in 2002 for Dreamcast and PlayStation 2. You travel along a set path across five wireframe levels, and shoot everything that you see. Sometimes your enemies drop collectible power-ups: one that upgrades your form, giving you extra protection against enemy attacks, another that lets you auto-shoot everything on the screen—useful for when you're feeling overwhelmed. At the end of each level is a boss. Are you with me so far? Good. Rez is an attempt to break down the sensory barriers—a synaesthetic catalyst that wants you to visualise sound and taste feelings. It's about the art of ancient civilizations, about the evolution of life, about the emergence of AI, about self and consciousness. It's a metaphor for life, yeah, inspired by 2001: A Space Odyssey and the art of Wassily Kandinsky. You could accuse it of being pretentious, to which the obvious retort is, "Yes, and?" Each level opens to a mostly barren space, with lines scrolling below you. Rather than music, the background is an ambient tone. Soon, basic enemies appear. You can point and click at enemies to shoot them, or hold the left-mouse button to lock-on—queueing up to eight shots. Release, and you'll fire at those locked targets. Are you with me so far? Enemies explode into thematic iconography. The Eye of Horus, or the Lion of Babylon—brief bursts of resplendent colour fading into the darkness. Clear a wave, you move to the next subsystem. The ambient tone gains a beat. The scrolling lines take on contours and definition. You don't fire instantly. Rez is a rhythm game, and it isn't going to let your desperate bid for survival spoil that. Shots are quantised to the beat of that level's music—firing off in rhythmic patterns that accompany the beat in often playful ways. This changes the pace and purpose of combat. It's not just about killing things—the new mouse controls make that fairly trivial—but also about playing with the music. It's about protecting yourself from incoming fire, but also creating riffs through chains of lock-on kills. It's part challenge, part jam session. You could accuse it of being pretentious, to which the obvious retort is, "Yes, and?" As you move deeper, the lines evolve into roads flanked by complex architecture, and the music builds and gains new layers. My second favourite level, Area 4, starts with a single, driving drum beat, onto which more percussion is added as you progress. It builds in intensity up to the seventh layer, when the whole thing shifts and warps into a single synthesised riff. And then it builds again, continuing to grow until you're fighting a boss made of cubes in the shape of a running man, set to guitar rifts over its primal drums, and a synthesised voice screaming "ROCK IS SPONGE". My favourite level, Area 5, is a poem about evolution set to Adam Freeland's Fear—a beautiful song that shifts from ambient soundscapes, to breakbeat drums, to a perfectly utilised sample of Marlena Shaw's California Soul. I have thought about this videogame a lot over the past 15 years. This PC release, called Rez Infinite, features all of the upgrades and options you'd want of a modern PC port, and also brings VR support. I tested on an HTC Vive, and I'm disappointed to say that virtual reality Rez doesn't do it for me. There's little sense of immersion—of being in this vibrant, sublime experience. Instead, there was a flatness, like I was playing on a massive, room-sized monitor. 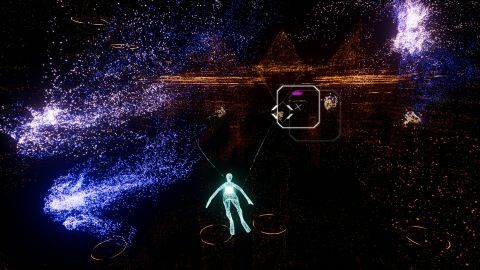 But Rez Infinite also features a new level, called Area X. This is Rez for VR, with full freedom of movement and a new visual style. Played out of VR, I found the ability to move something of a distraction. But in VR, with head tracking, it felt completely natural. The real disappointment is that there's only the one new level. As it stands, it's an excellent proof of concept. If you want to be reductive, Rez is a simple shooter with just a handful of levels. But if you want to be reductive, Rez probably isn't for you. Accept its big ideas and singular purpose, and it's like nothing else you've played. What Rez does still feels remarkable, but only if you're prepared to meet it half way.